Staying active is not only good for the mind and body. It may also be good for the brain, according to a new report. 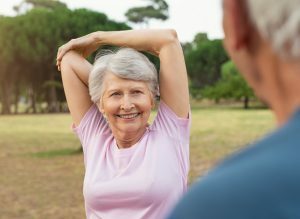 The study found that staying physically and mentally active in middle age was tied to a lower risk of developing Alzheimer’s disease or other forms of dementia decades later. The findings add to a growing body of evidence that physical and mental stimulation may help to ward off the memory loss and thinking problems of Alzheimer’s disease. The study, published in the journal Neurology, found that various activities were tied to a lower risk of dementia in old age. Activities included reading, playing instruments, singing in a choir, going to concerts, gardening, doing needlework or attending religious services. The study looked at 800 Swedish women who ranged in age from 38 to 54 at the start of the study. At that time, they recorded participants’ intellectual activities, such as reading and writing; artistic activities, such as going to a concert or singing in a choir; manual activities, such as needlework or gardening; club activities; and religious activity. The researchers followed them over 44 years, starting in 1968. During that time, 194, about one in four, of the women developed Alzheimer’s disease or another form of dementia. Women who engaged in mental activities most frequently were 46 less likely to develop Alzheimer’s disease than those who were least likely to participate in such activities. Those who were most physically active were more than 50 percent less likely to develop dementia than those who were generally sedentary. No one activity can guarantee that you won’t get Alzheimer’s disease. But the results of this and other studies show that physical and mental stimulation can be helpful in reducing your risk. Doing group activities, like singing in a choir, can provide social connectedness, which has been shown to reduce dementia risk. Other studies have found that regular physical activity along with mental challenges like doing crossword puzzles can likewise help to reduce dementia risk.